A short break walking holiday traversing the vineyards of the Beaujolais Grand Cru. Daily wine tasting of some of the finest wines in the region such as Fleurie, Moulin a Vent, Julienas, Chiroubles and Brouilly. Wine pick up service included. 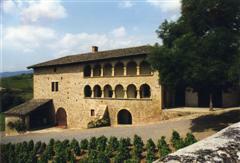 Easy to moderate walking through vines in secluded valleys and along panoramic ridges. Great Beaujolais hospitality where your hosts will reserve you a warm welcome and enjoy giving up their time to make your stay extra special. Small and charming guest houses all on vineyards, where you'll get to try their wines. 5 nights in small and comfortable guest houses with ensuite accommodation on vineyards with plenty of local character. All breakfasts, 3 picnic lunches and 4 evening meals included in the price. This independent walking holiday takes place in the Beaujolais region, located to the north and east of Lyon, which is made up of a series of beautiful rolling hills getting progressively higher as you go north, giving rise to some delightful walking. Despite the relatively gentle nature of their slopes, the scale of the peaks and the depths of the valleys create a landscape of great panoramas and rich contrasts. This short break, self-guided walking holiday traverses the northern Beaujolais, where the vines produce the 10 Grand Crus of the region. A pleasant combination of rich fruity flavours and more complex characteristics, makes these French wines unique, with some being grown only on a few hundred hectares. You'll get the chance to sample them at your guest houses, which are on vineyards, as well as at other producers along the way. Your walking trail snakes its way along secluded and picturesque valleys, as well as along some panoramic ridges, away from the main roads and noise of the Saone Valley. You'll pass historic villages, chateaux and a host of other interesting sites on route. At the end of each day you'll be welcomed with open arms at your small, quaint guest houses where the hospitality is excellent and you'll be treated to great local food and wine. 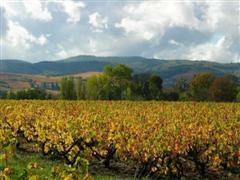 This independent walking holiday in the Beaujolais region of France is made up of 4 walks moving between guest houses. The walks are reasonably easy for the grade, especially in terms of the amount of ascent and descent. An average days walking includes about 15km with limited ascents and descents amounting to about 300m. There are options on all of the days to make the walking harder or easier. The walk takes place on good paths and country lanes. Some paths can be rough and stoney in places with the odd steeper section, so walking boots are essential. Today you'll follow a trail leading you downhill towards the Ardieres Valley, passing through pretty hamlets, historic chateaux and villages such as Régnié-Durette, with its double spired church built from white limestone. Regnie was the last of the 10 Crus to be recognised as separate labels from the Beaujolais Village and you can try it at your guest house, situated near the village of Beaujeu, the historic capital of the Beaujolais region. 15km, +180m. Once you have booked on this independent walking holiday in France, further information about the walking, the region and what to bring, will be sent to you. We do have a web page dedicated to what clothes and equipment you should bring. In addition, our travel shop has direct access to all the top walking and travel retailers. Please contact us if you need any further information. On our independent walking holiday in the northern Beaujolais, you will stay in a number of charming bed & breakfasts full of local character (3 corns quality). All rooms have private bathrooms. Examples of the guest houses used on the holiday are shown below. They are small, very comfortable guest houses where you'll be treated to some great Beaujolais hospitality. They'll enjoy giving up their time to make your stay extra special. All of the guest houses are on vineyards where you'll be treated to wine tasting allowing you to discover the local wines and find out more about how they are produced. Transfers between Lyon Airport or train station and the Beaujolais region of France are included in the price of your independent walking holiday. The airlines Easy jet, Flybe and British Airways have scheduled flights from the UK - Luton, Edinburgh, Birmingham, London Heathrow and Gatwick - to Lyon St Exupery airport. Eurostar and the TGV provide a relaxing journey from London direct to Lyon Part Dieu, as well as trains changing at Lille or Paris. Please use Rail Europe's train finder on our travel page to organise your train journey. There is a practical train time leaving London at 9am and arriving in Lyon at 3pm. Please contact us before booking to check for other practical times. 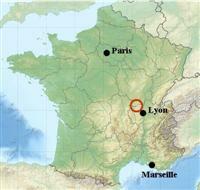 Once in France, the journey from Calais to the Beaujolais area takes about 7 hours (excluding long breaks). Tolls amount to about 35 euros each way. Controlled parking is available at the airport for 50 euros. Other secure but non-surveilled parking is available free of charge.